Located in Jamaica's Main Tourism Hub three miles east of Montego Bay, Sandals Montego Bay is 90 minutes away from Ocho Rios and its world famous Dunn's River Falls, only 5 minutes away from the Sangster International Airport and 10 minutes away from the town center. 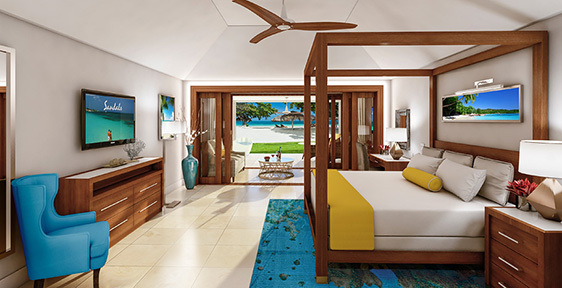 Set on the North Coast's largest private white-sand beach, it is no wonder that Sandals Montego Bay has so many beachfront rooms and suites, with panoramic ocean views, offering the ultimate romantic setting for two people in love. A secluded tropical paradise for two people in love, these incredibly lavish Love Nest Suites are located directly on the beach. The magnificently-appointed bedroom features exquisite handcrafted mahogany furniture, a four-poster king-size bed, a large smart television, and a bathroom with a shower and whirlpool. A separate elegant living room boasts opulent furnishings and world-class amenities including a stylish sofa, fully-stocked wet bar, dining table, second smart television and iPod docking station. 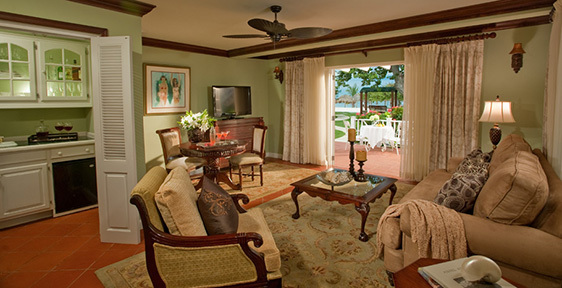 These romantic suites open to a furnished, private balcony with magnificent views of the ocean and lush tropical gardens. Butler Elite and 24-hour room service are included. Ideal for lovers of luxury, these ultra-spacious Love Nest Suites are located directly on the beach. 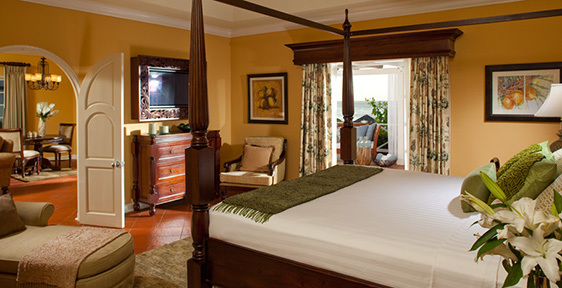 The sumptuous bedroom features elegant mahogany furnishings, a four-poster king-size bed, smart television, iPod docking station and a bathroom with a shower and whirlpool. The separate sprawling living room boasts elegant furnishings, a stylish sofa, wet bar, second smart television and offers access to a private patio where you can dine al fresco and admire the stunning ocean views with the one you love. Butler Elite and 24-hour room service are included. These completely renovated Love Nest Suites are located just steps from the shore. 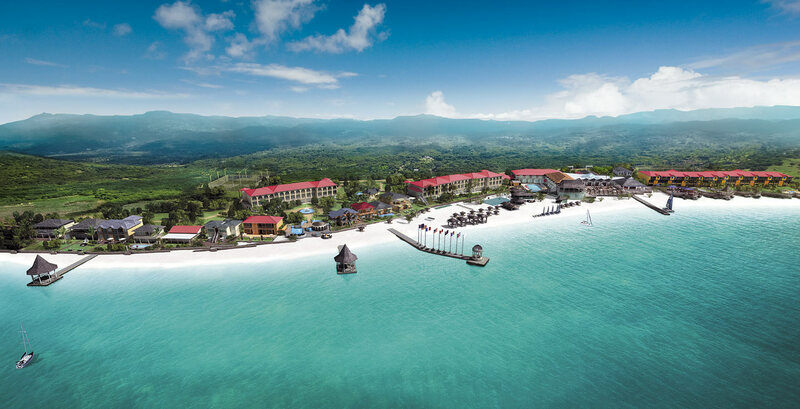 Wake up each morning to the soothing sound of the waves and simply walk out onto Jamaica`s finest private beach. Wall to wall glass doors open up to reveal a spacious patio with a private Tranquility Soaking Tub and bistro dining set. Enjoy private meals served by your butler and take in the beauty of the calm, reef-protected sea. Inside, an airy master bedroom welcomes you and the one you love with a custom-crafted, king-size bed and stylish furnishings; while a separate living room presents the perfect place to unwind. Appointed with modern luxuries, these exceptional suites offer iPod docking stations, a wet bar stocked daily with premium spirits and wines, and two 48" Smart televisions. An escape within itself, the lavish spa-style bathroom showcases an expansive rain shower with bench, long vessel double sink and a large backlit mirror. Your personal butler will take care of your every wish including VIP check in, beachside and poolside service, and 24-hour room service. Butler Elite and 24-hour room service are included. With 9 tantalizing restaurants offering tantalizing temptations, deciding where to go for dinner might well be the most challenging part of your day. Impeccable service, exquisitely-prepared international cuisine, and a romantic ambience make every dining experience absolutely extraordinary. Our chefs are known for their dedication to every authentic detail, giving you the same phenomenal culinary experience you'd expect in the most acclaimed restaurants across the globe. 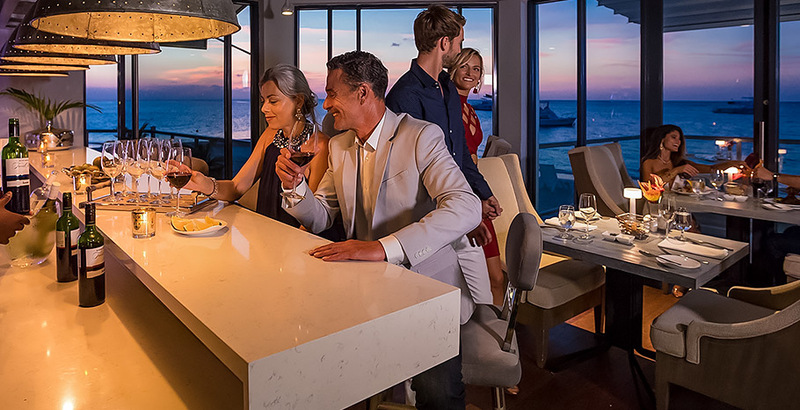 And accompanied by the renowned Mondavi Wines, every meal becomes a celebration of your love at Sandals Montego Bay. 24 Hour Room Service for Butler level categories and Room Service from 7:00am to 10:00pm for Club Level rooms. For those guests with Special Dietary needs, please make contact with their Culinary experts who will assist as best as they can. Desk is located in the Lobby next to the Front Desk. Opening hours are 8:00am to 4:00pm daily. Sandals Montego Bay has a “No Tipping” policy for all their Team Members except Butlers and Spa Therapists.